"There is today a real demand for property around a budget of 1 to 1.5 million euros. And if the owner trusts us, our estimate, realistic and always consistent with the quality of his property and average market prices, will receive all the necessary publicity, allow him interested visits, a sale within a reasonable time..."
"We favor the well located properties, of character, and of course with all the essential services, such as the swimming pool..." For the sale or purchase side, Provence Secrète engages on win-win transactions, a fair estimate at the right price. We are appealing for owners which want to sale quality properties, espacially old farmhouses with nice services in the range of 800000 to 1200000 € where the market is promising in potential buyers. "On the sales side, these last few weeks have been rich in demands for property with character from our potential buyers, especially foreign buyers..."
A very strong demand for seasonal rental properties !
" We are more than ever in search of charming properties with high services, real personality or atypical character..." says Sébastien CHARRIER in charge of seasonal rentals. "Our commitment is fair trade at the right price ; this is our vision for a long time... "
"A huge demand of seasonal property for rent!" "Our very complete portofolio of various seasonal rentals is however not enough to meet all the demands..."
A house on the cover and another one on the opening page of "nice houses to rent"... Should we consider that the Provence Secrète selection on the Provence/Luberon is simply beautifull ? "a magnificent stone villa offering open view on this famous village..."
Why did you name your real estate agency Provence Secrète? "I like when people look for me and wonder before arriving in the agency in the heart of Ménerbes... The most beautifull houses are also often hidden and misterious..."
Provence Secrète : " The market is becoming a buyers' market"
"In the heart of vineyards and lavander fields... with view on the Ventoux. Renovated farmhouse for 11 guests with large swimming pool in the golden triangle of the Luberon..."
"Finest addresses are often a well kept secret..."
"Let's meet buyers and sellers at the fair price..."
"Luberon, an active real estate market, sure values"
Provence real estate market analysis and Provence Secrète agency best advices to buy a property are quoted in the New-York Times ! interview from Benjamin Deswarte. "Real estate market resumption, yes but..."
" My role is to concretize dreams "
" The dishonest agents, who manage to bias the system by practicing without a registred permit, represent a tiny part in the business "
Provence Secrète is nowadays leader in the market knowledge and the deontology to practice it. It's a guarantee for a wide visibility in paper and electronic advertising : an agency really supported by word to mouth for its professionalism dedicated to the profit of its customers ! The real-estate market of Luberon and Alpilles attracts numerous foreigners and Parisians. The top of the range is next to the property of exception, the old farm, the mas in dry stones by way of the house of village there. Stroll in the shade of the Provençal must. "The market down from range restarts, on the properties which are estimated at their just value..." Sylvain Lenoir, Provence Secrète in Ménerbes. In the heart of Provence, there is a real estate agency that specializes in the sale and seasonal rental of houses and properties with charm and character. "Here the access price starts at € 1,5 million"
Do the old stones keep their attraction power ? Do the old stones keep their attraction power ? "We drive throughout Provence everyday like old stones hunters... our mission is to initiate a connection between people and a property..."
Charming Provence - The clientele of the Luberon hills. 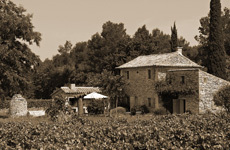 A guest house in the countryside, located in the Luberon region. Here is a "Bastide" just like in the XVIIIth century, beautiful and pleasant to live in.